The New Years Eve Mixed Pairs was held on a simply delicious final day of 2017. This year’s event had a fantastic field of 30 pairs participating on the Indiana Course at Desert Springs, which was presented in excellent condition. The leaderboard was a very congested affair with six couples all within two points of each other. The winners, by virtue of low handicap, for the final competition of the year were Chris Cole, and Sue Garrod. 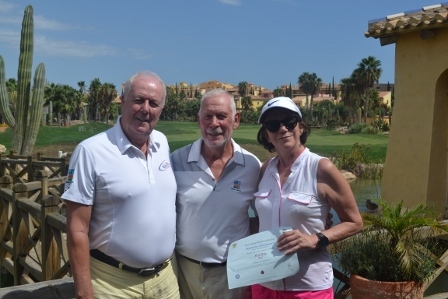 Runners-up position went to husband and wife team, David and Sue Hadden. The prize giving ceremony took place on the deck and was hosted by Club Captain Chris Cole. A total of 27 players competed for The Christmas Individual Stableford played on Boxing Day. The beautiful Indiana Course was bathed in sunshine under powder blue skies all day long. 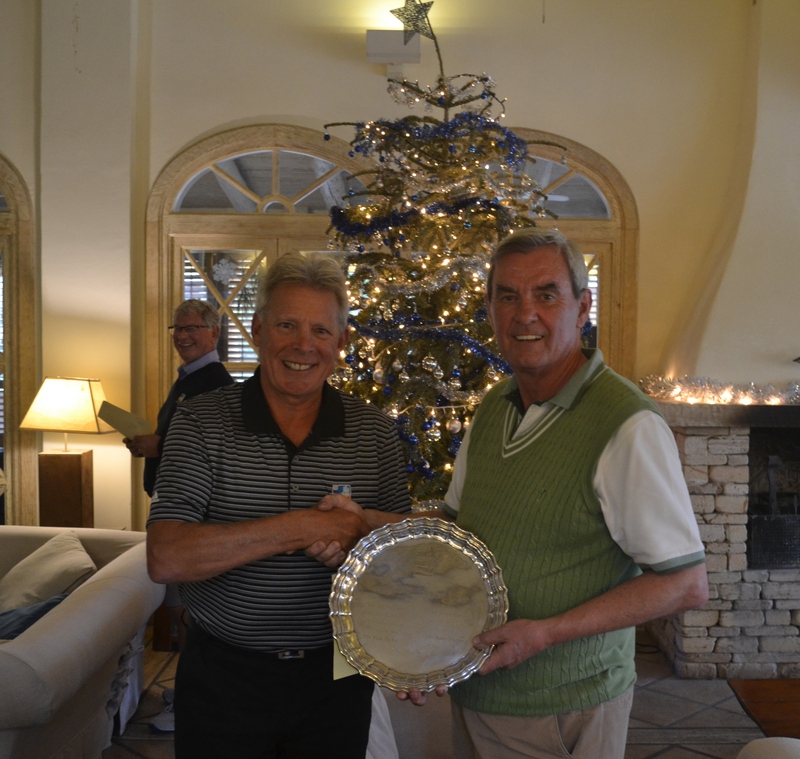 Stuart Baynham took out the festive victory with a score of 41 points, from runner-up Dennis Stafford on 37 points. The prize giving ceremony took place on The Deck and was hosted by Club Vice-Captain John Haydon. A field of 32 players competed for The Constitution Cup on the beautiful Indiana Course with glorious weather conditions which were enjoyed by all. An extremely close finish was seen in the Mens Event, with Robert Wallace victorious after a round of 79 (Low Handicap), from Runner-Up Duncan Boston. For the Ladies, Dee Tomlinson was crowned Champion with a round of 95, from Jaki White in second. The prize giving ceremony took place on The Deck and was hosted by Club Captain Chris Cole. The Presidents Cup brought to an end a very busy period of tournament golf at Desert Springs. Another fantastic field of 55 players entered the event held on the beautiful Indiana Course under powder blue skies. A new ‘Major’ winner was crowned champion with David Hinton scoring 39 points. Lee Coxon took the runners-up position with 36 points, followed by Paul Taylor and Phil Angus, who both scored 35 points. The prize presentation was held on The Deck and was hosted by Club Captain, Chris Cole. Club Captain for 2017 Chris Cole hosted his Charity Day on a gorgeous sunny day in late October. The stage was set for 20 Teams of four to compete in a Scramble Tournament on the beautiful Indiana Course. The team of Graham and Alicia Cook, and Chris and Elaine Robinson were crowned Charity Day Champions, followed by Howard and Deidre Taylor, and Patrick and Rita Sweeney as runners-up. A simply wonderful day and evening was had by all, with lots of money raised for the Captain’s chosen charities for the year. 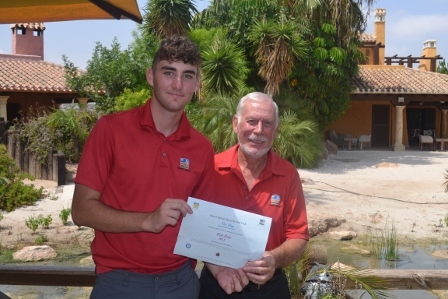 The prize presentation was held as celebrations went long into the night in El Torrente Restaurant and was hosted by Club Captain Chris Cole. A field of 27 players teed it up for The Past Captain´s Team Challenge a day before the festivities of The Captain´s Charity Day scheduled for the following day. A stunning morning greeted the players for the event held on the beautiful Indiana Course. 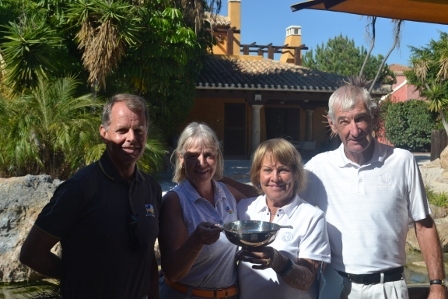 'Team De Graaf' comprising of past captain Wikkie De Graaf, Liz McCartney, Alan Patterson, and Barry White took home the honours for the day. The Club Handicap Salver was held over two days over another glorious sunny weekend in October. A field of 27 players entered the event on the beautiful Indiana Course which was played under medal conditions. An extremely close finish was seen in the Men´s event with two players going shot for shot for the title down to the very last hole. There had to be a winner though with John Crosby prevailing with a combined score of 145, only beating David Hadden by virtue of lower handicap. Third place went to Lee Coxon on 148. For the Ladies, Elaine Robinson was crowned champion with a score of 149, just edging out runner-up Dee Tomlinson on 150, with Liz Shutler third on 153. The prize presentation was held on the Deck and hosted by Club Captain, Chris Cole. The Indiana Course at Desert Springs hosted The Autumn Trophy with the fairways bathed in glorious sunshine all day long. 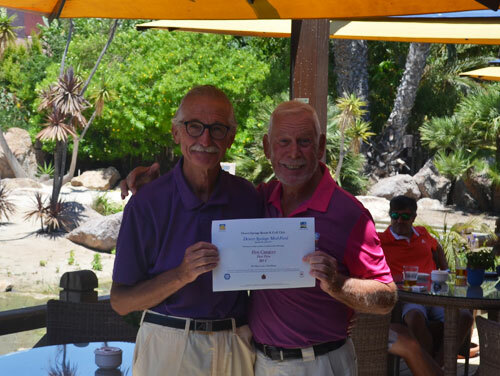 A wonderful field of 49 players took part in this Individual Stableford competition in their quest to be the Champion. 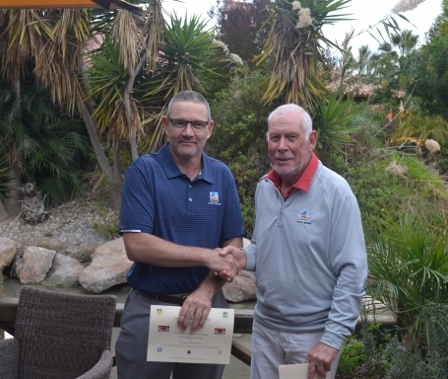 Mike Thorpe continued his fine run of form to claim back to back events, again by virtue of lower handicap, from Phil Angus this time, with a score of 40 points. Elaine Robinson came third with 39 points. The prize presentation was held on the Deck and hosted by Club Vice-Captain John Haydon. The Desert Classic Tournament is played over two rounds of the beautiful Indiana Course in October each year. This year’s renewal had a fantastic field of 41 players competing in stunning conditions trying to be crowned The Desert Classic Champion Golfer. After all scorecards had been checked, two golfers couldn’t be separated on 73 points. However, Mike Thorpe raised the trophy aloft by virtue of lower handicap, with second place going to Stuart Baynham. 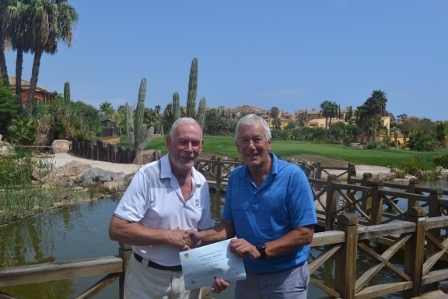 Third place went to Peter Bielby only one point behind with 72 points. A field of 22 players enjoyed a beautiful sunny day on the always challenging Indiana Course. The perfect playing conditions ensured a wonderful day’s golf for all. Alan Patterson blitzed the field to take out the event with a Nett 66. Tied on Nett 70 were Michael Nielan and Ray Charles, with Michael taking the runners-up position by virtue of lower handicap. 16 pairs teed it up in beautiful playing conditions for the annual September Greensomes. The format ensures lots of tactical thinking, with plenty of discussions taking place between pairings trying to plot their way round the Indiana Course in their quest to become Champions. The pairing of Michael Neilan and Dee Tomlinson combined majestically to put together a fantastic round and score 41 points to secure victory. They were closely followed by the pairings of Robert Wallace and John Haydon, and Dennis Stafford and Ray Charles, who both scored 39 points. A total of 23 players teed it up at Desert Springs to compete for the September Stableford. The sunny sky and beautiful conditions of the golf course provided the perfect setting for the players. A new winner was seen for 2017 with David Hinton coming out on top with a score of 37 points. Runner up went to Phil Webster, with Barry White in third. A field of 21 players competed on yet another sunny and beautiful day at Desert Springs for this year’s Flag Tournament. This unique event is not about scoring the most points or how many shots under your handicap you can play, but how far you can get around the golf course once you’ve used all of your available shots. Once you’ve played your last shot, the position in which the golf ball finishes is marked with a Flag. If you are able to play 18 holes and still have some shots left, then you start again on the first tee until you have hit them all ! The winner is the player who gets the furthest on the course. This year’s winner was Theo Goodhall who managed to hit two more shots down the 1st hole after finishing his round. Runner-Up was Charlie McKinnes, with David Hinton third. 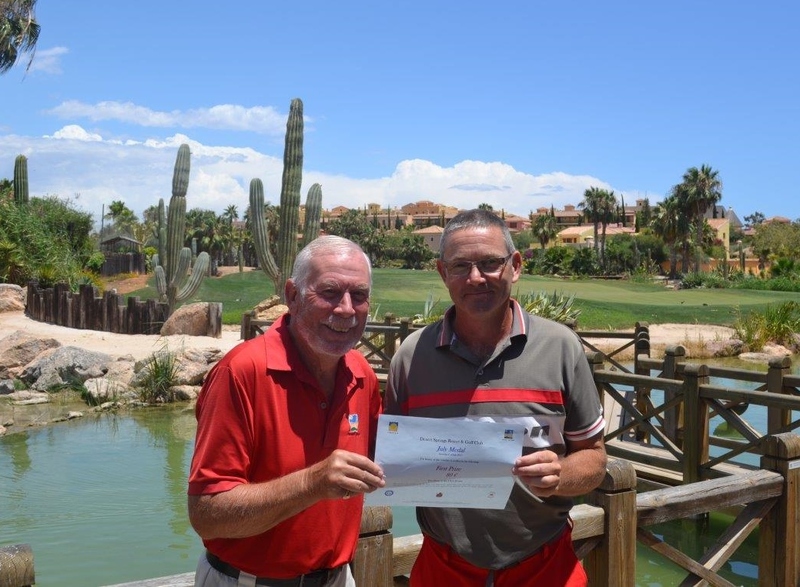 A total of 30 players gathered at Desert Springs to compete for the August Stableford. The sunny sky and beautiful conditions of the golf course provided a warm welcome to the players, who took advantage of the conditions to post some fantastic scores. Zoe Griffiths played a sensational round of golf to win the event, scoring a mammoth 44 points. 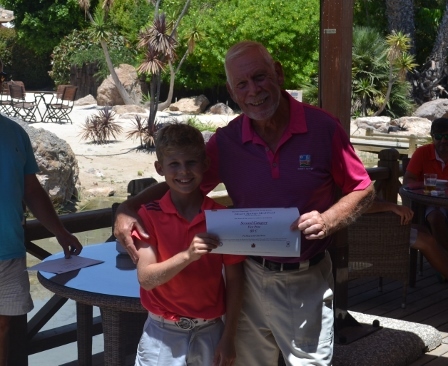 Theo Goodhall took the Runners-Up position with another great score of 42 points. The Indiana Course played host to the annual Summer Challenge Cup, gathering a great field of 29 players competing in this 18 hole Stableford Competition. A stunning summers day greeted all competitors for the challenge that lay ahead. The course certainly played quite tough, as the scoring showed, with ‘par’ definitely being a good number for the day. Mark Danson held the cup aloft (by virtue of lower handicap), from in second place, Robert Wallace, after both players couldn’t be separated scoring 37 points. Third place went to Phil Angus. The prize presentation took place on The Deck at the Clubhouse and was hosted by Club Vice-Captain, John Haydon. The Indiana Course again played host to the annual Professional’s Challenge Cup. The event is played between the Desert Springs Golf Professionals up against a field of member’s and guests pairs, who compete in a Fourball Better Ball format. 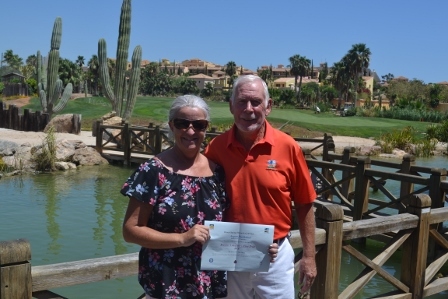 This year, a total of 15 pairs enjoyed the fantastic conditions of the Indiana Course at Desert Springs on a beautiful summers day, playing some great golf which was proved by the low scoring, leading to a very impressive leaderboard. Desert Springs Golf Professional Alfonso Castineira teamed up with Desert Springs Services Manager Kirk Lovell to set the target of 40 points to beat. Four pairs were able to better that score this year. In fourth place with 42 points were Phil Angus and David Smith, third place went to Dennis Stafford and Richard Fuller with 44 points, with second place going to Barry and Jaki White who scored 45 points. The winners of the event however, with a sensational score of 46 points, were the two brothers, Liam and Charlie McKinnes. Thank you to all participants on a great tournament. 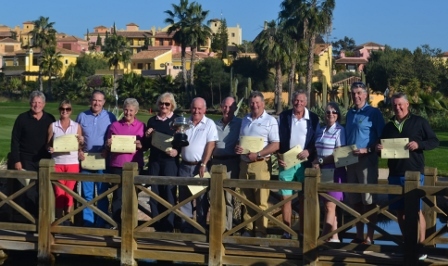 The prize presentation took place on The Deck and was hosted by Club Vice-Captain John Haydon, and Desert Springs Golf Professional Alfonso Castineira, who presented the trophy to the winning team, as well as the prizes for all pairs who were able to claim that for 2017, ‘We beat the Pro’. The Desert Springs Med-Ford is a unique competition of two different formats in one round of golf. The front 9 holes are played as Medal play with the back 9 played as a Stableford. 21 players entered the event on the beautiful Indiana Course played on a glorious sunny day under powder blue skies. Due to the uniqueness of the competition there were tied winners, with Charlie McKinnes and Andrew Markham sharing the spoils. Runner-up was Peter Eldridge. The prize giving ceremony took place on the Deck and was hosted by Cub Vice-Captain, John Haydon. A field of 17 players took to the fairways for the July Medal. The Indiana Course was presented in beautiful condition on a glorious warm and sunny day. 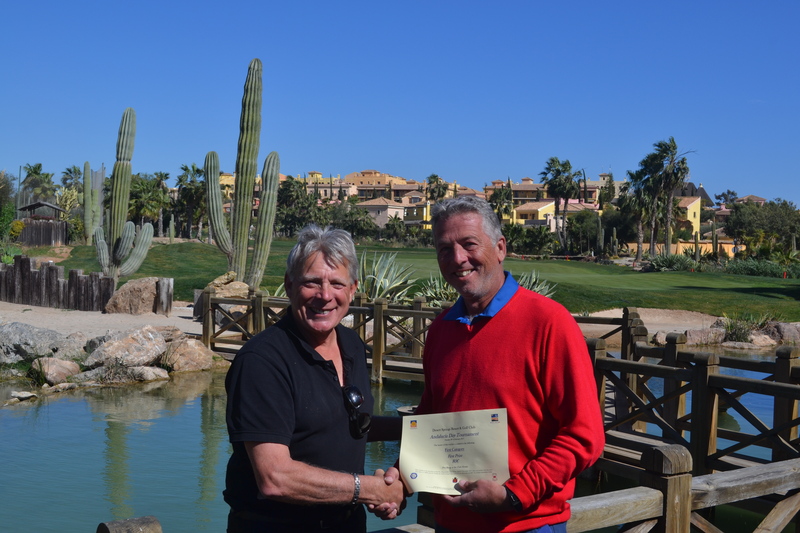 Stuart Baynham won the event with a score of Nett 68. Duncan Boston took second place with a Nett 69 by virtue of lower handicap from Peter Eldridge in third. The prize giving ceremony took place on the Deck and was hosted by Club Vice-Captain, John Haydon. A fantastic field of 55 players teed it up on the The Indiana Course for the June Stableford. 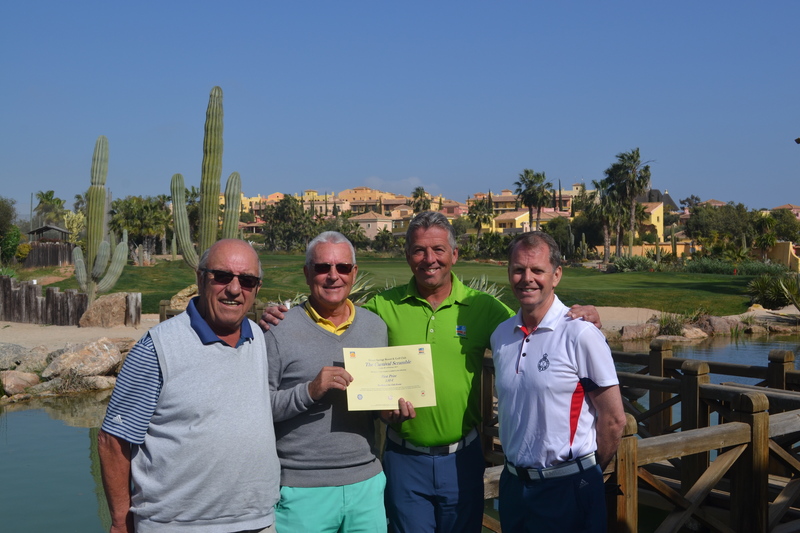 The course was presented in beautiful condition and the sun shone down all day for everyone. Another first time winner was welcomed with Willie Burns victorious with 41 points, by virtue of lower handicap, from Sandra Edwards in second. Roger Butters finished third scoring 39 points. 31 players took to the beautiful fairways of The Indiana Course for the Director’s Trophy. Delightful weather conditions of 28ºC and powder blue skies ensured a memorable golfing day on the Indiana Course, which was presented in superb condition. A brand new winner was welcomed to the winners enclosure with Jackie Burns victorious with a fantastic score of 41 points. Alan Patterson finished runner up with 39 points, followed by Lee Danson with 38 points. 25 players took to the pristine fairways of The Indiana Course for the May Medal. Glorious sunshine played out all day long which ensured lots of very happy golfers. David Smith was victorious by 3 shots with a fantastic round of Nett 67. 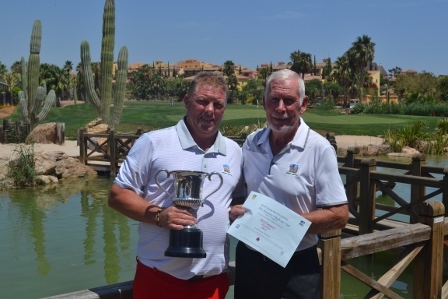 Dennis Stafford was runner-up with a Nett 70 from Howard Taylor in third scoring a Nett 71. A great entry of 18 pairs took to The Indiana Course for the Open Pairs Tournament. The sun shone down and the course was presented beautifully for the event. The pairing of Richard Fuller and Duncan Boston were victorious with a tremendous score of 44 points. Father and Son Team, Mark and Lee Danson were runners-up, by virtue of lower handicap, from Alan Hewitt and Cliff Leslie in third, after both pairs scored 42 points. 25 players took to the fairways for the May Stableford. The Indiana Course was presented in beautiful condition on a glorious sunny day. Ian Tomlinson won the event with a score of 36 points. David Hinton took second place with a score of 34 points, from Josephine Baynham in third on 33 points. The prize giving ceremony took place on the Deck and was hosted by Club Captain, Chris Cole. Desert Springs is always a hive of activity during the Easter period, organising events for the family, and the Easter Cup brought the curtain down on a wonderful week of tournament golf. A total of 72 players competed in this year’s Easter Cup. The superb conditions of the Indiana Course and the beautiful weather ensured a wonderful day was had by all. 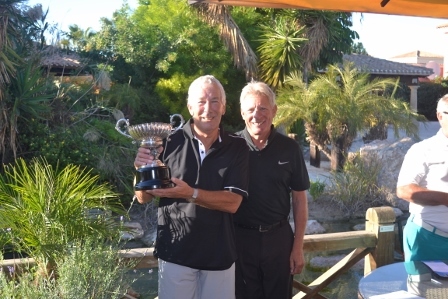 David Smith was crowned champion by virtue of lower handicap with a score of 37 points from Runner-Up Barry White. 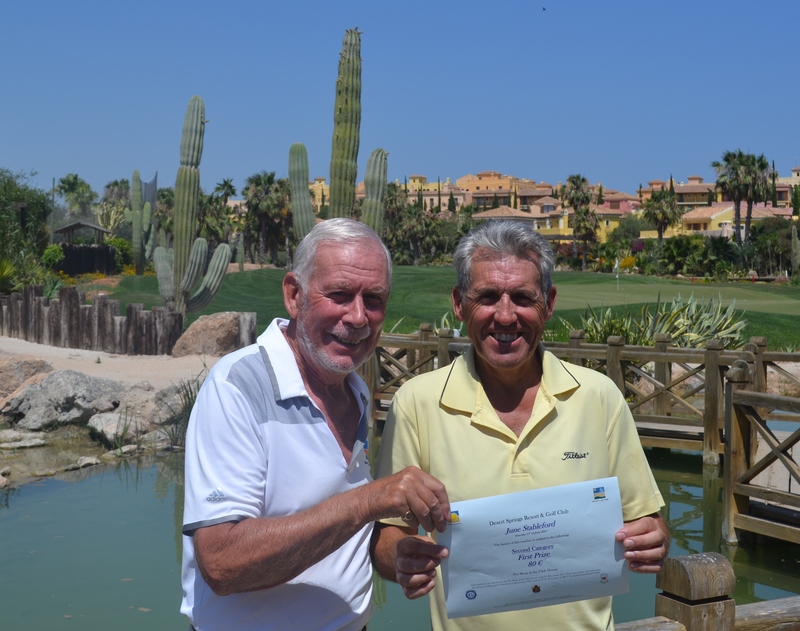 Third place went to Jim Kendall on 36 points, again by virtue of lower handicap, from Keith Kingdon. The 2017 Captain's Drive In took place on April 14th, gathering a sensational field of 24 teams of 4 players, who competed in a Scramble event with perfect weather conditions. The theme for this year was ‘Black and White’, with golfers dressing up accordingly ! The day began with a drinks reception at the unique Cave Bar, where 'mulligans' and flags were sold, the flags being offered to players who wanted to guess where the first drive of New Captain Chris Cole would finish up. All the money collected would be sent to the Captain's Charity. 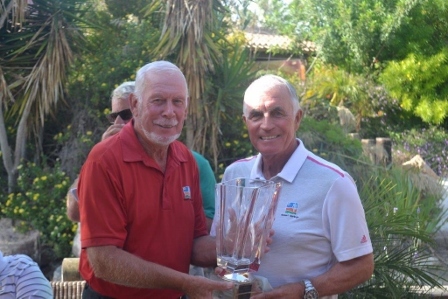 After the competition, over 120 players and guests gathered at The Crocodile Club for a lunch and prize presentation. Attendees were treated to a stirring performance from the Member’s band, ‘Springs’, which was thoroughly enjoyed by all. The winning team, formed by Richard and Harry Betts, and John and Helen Crosby, won with a score of Nett 54 on a countback from Alan Hewitt, John Haydon, Mark Danson, and Lee Danson. 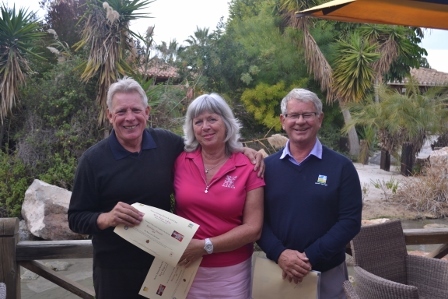 Third place with a score of Nett 56 went to Alan and Mary Patterson, playing with Peter and Jackie Eldridge. A fantastic day was had by all and a great welcome given to Desert Springs Club Captain Chris Cole to launch into his year ! Alongside the second round of the Club Championship, the Club Championship Stableford gathered a total of 38 players, competing in an 18 hole stableford tournament. The winner of the event was Freddie Beames with a total of 38 points, from Chris Robinson with 37 points. The prize presentation took place during the Club Championship Dinner, hosted by former and new Captain’s Martin McLellan and Chris Cole. The prestigious Club Championship Competition takes place each year and is traditionally competed for over a 2 round medal play format. The Club Championship crowns the Men’s and Ladies’ Champions, who must battle against the best players and produce the best gross score on the Challenging Indiana Course, played from the Championship Tees. Fast greens and demanding pin positions lay in wait for all those trying to become Club Champion ! After round one, Alan Patterson took the early lead in the Men’s Championship with 84 strokes, followed by Robert Wallace with 86 and Chris Cole with 89. On the Ladies side, Jaki White and Susan Kenny each posted a 95 to be joint overnight leaders. In round two, the Men’s leaderboard took quite a few twists and turns throughout the morning but Alan Patterson held firm to be crowned Champion. Runners-up position went to Mark Danson, with Robert Wallace in third. On the Ladies side, Jaki White continued her pillar to post victory with another solid round to take the spoils from Susan Kenny. Many Congratulations to both ! 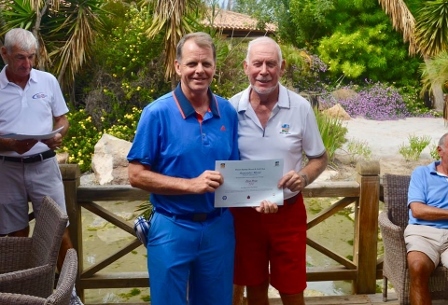 Following on from the tournament, the Club Championship Dinner and Prize Presentation, hosted by former and new Captain’s Martin McLellan and Chris Cole was held in El Torrente. 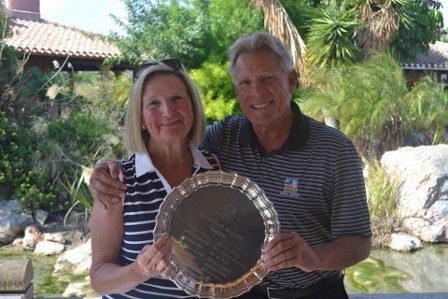 The Indiana Masters, which coincides with the US Masters at Augusta, gathered a great field of 44 players, all striving to put their name on the Honours Board after competing in this 36 hole Stableford Competition. The Indiana Course was presented in beautiful condition for the two days and a new name was added to the illustrious list of past winners, with John Crosby proving a very popular champion with a fantastic combined score of 78 points. 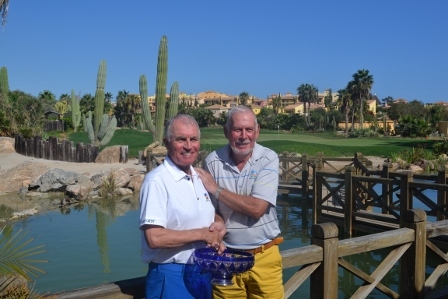 Runner-up on a countback with 73 points was David Hadden, from Freddie Beames in third. The prize presentation was held on The Deck and was hosted by Club Captain Martin McLellan. 16 players took part in the March Electric. A gorgeous sunny weekend ensured perfect playing conditions for both rounds on The Indiana Course which was presented in beautiful condition. The individual event was played under Medal play with the best score recorded on each hole over the two rounds to count towards the Eclectic score. Alan Hewitt came out on top with a blistering Nett score of 60. 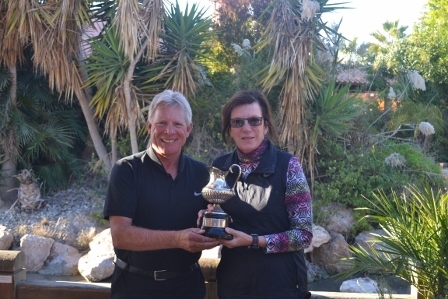 Mark Danson took second place, (Nett 66), from Jaki White in third with a Nett 67. The prize giving ceremony took place on The Deck and was hosted by Club Captain Martin McLellan. 36 players teed it up on St Patrick’s Day, with everyone giving their all to try and win the Bowl. A gorgeous sunny day ensured perfect playing conditions on The Indiana Course which was presented in beautiful condition. Richard Fuller strode into the winners enclosure, being crowned champion with a score of 37 points. Freddie Beames took the Runners-Up position on 36 points, with David Smith in third, 35 points (By virtue of lower handicap), from Kirby Garrod and Phil Angus. The prize giving ceremony took place on the Deck and was hosted by Club Vice-Captain Chris Cole. A sensational total of 78 players competed on Memorial Day. A beautiful warm sunny day ensured perfect playing conditions on The Indiana Course which was presented impeccably. Stuart Baynham blitzed the field to win the event with a score of 43 points. Jaki White took second place on 38 points, with Paul Taylor third on 37 points. 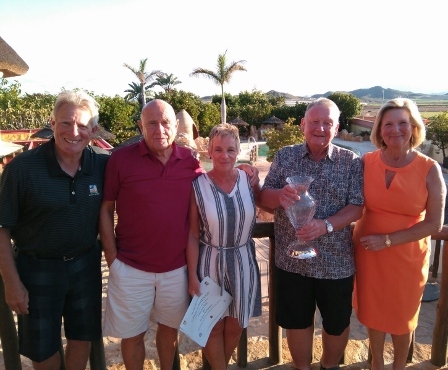 The prize giving ceremony took place on The Deck and was hosted by Club Vice-Captain Chris Cole, Committee Member Paul Taylor, and Pauline Carver. A field of 24 players took to the fairways for the Desert Springs Waltz. Cloudless sunny skies adorned The Indiana Course which was presented in beautiful condition. 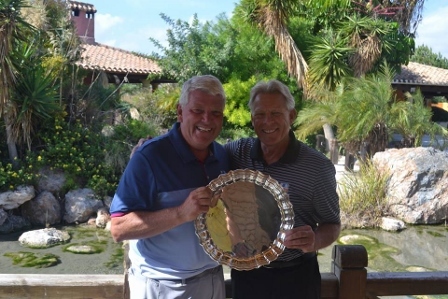 The team of Alan Hewitt, Mark Danson, and Lee Danson were crowned champions with a fantastic winning team score of 84 points. Runners-up with a very commendable 81 points were the team of Phil Angus, and Stuart and Josephine Baynham. The prize giving ceremony took place in the Clubhouse and was hosted by Club Vice-Captain Chris Cole. 31 aspiring golfers teed it up for Andalucia Day. The Indiana Course was presented in stunning condition. The tournament was played in wonderful spirits, with everyone enjoying a fantastic day. Richard Fuller continued his fine recent run of form to win the event with 37 points, on a countback from Freddie Beames. Third place went to Stuart Baynham on 36 points. Seven teams competed in The Carnival Scramble which was played on a glorious sunny morning with The Indiana Course presented in beautiful condition. Carnival Champion Golfers for 2017 were the team of Ray Charles, Dennis Stafford, Richard Fuller, and Alan Patterson, with a fantastic score of 55. Just missing out, and runners-up on the day were James and Sarah Greenall, and Peter and Gill Andrews, on 56. A total of 19 players competed for The Desert Springs Open Championship which was played over two rounds. The Indiana Course was presented in beautiful condition and the weather for both tournament rounds was just sublime, powder blue skies a plenty. It proved to be a wonderful weekend for our Lady golfers. 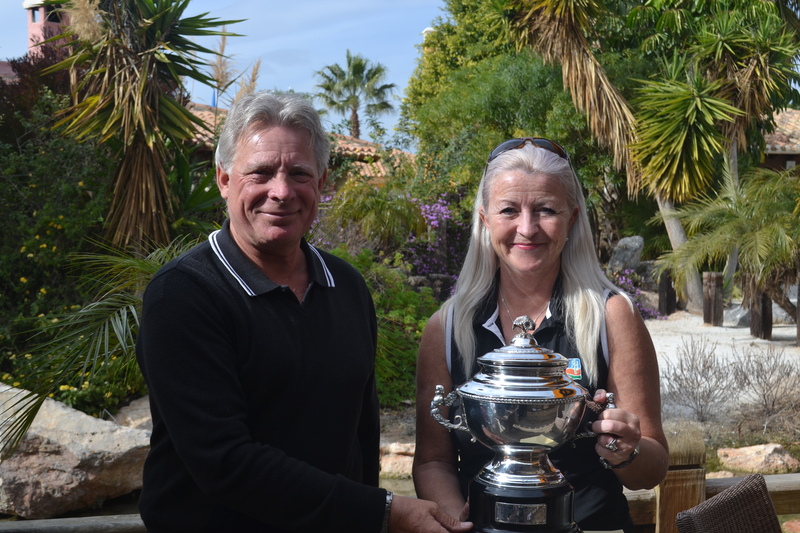 Zoe Griffiths put together two fantastic rounds of golf to be crowned champion with a combined stableford score of 76 points, from Runner-Up Sarah Greenall with 71 points, and Graham Cook with 70 points. A magnificent field of 57 players took to the first tee for the Epiphany Challenge which is traditionally held on Three Kings Day, the 6th January. The Indiana Course which was presented in superb condition for the event, with some fantastic scoring. It is extremely rare in Golf to hear these numbers spoken as a winning stableford score, but with a simply sensational round played from start to finish, Harry McKinnes was crowned champion with 50 points. Runner-up was Freddie Beames on 38 points (Low Handicap), from Kirby Garrod in third. The Community Trophy kicked off the 2017 tournament year in style with 45 competitors taking part on the day. The course and weather were both magnificent. The format is that of a team event whereby the respective communities of the resort compete in a stableford tournament to claim the title as the best Community in Golf. The combined communities of Desert Drive and Las Sierras formed one team and came out triumphant to be crowned winners of the first event of 2017. Congratulations to all players.